mundane jane: (Just about to be) hot off the presses. (Just about to be) hot off the presses. It's the hottest thing in scrapbooking techniques and Maelynn is all over it. Her book gives step-by-step, fear-banishing instructions for putting your unique mark on all your papercraft projects. And if the idea of taking a pen to one of your pages makes you nervous, just wait until you get a look at all the projects inside. 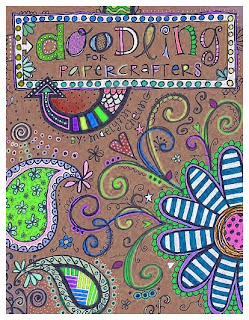 Each of these fantastic doodling designs was created--not by professional in-house designers--but by actual papercrafters just like you. We loved everything about working on this book--from Maelynn's easy-to-understand instructions, to the totally hand-drawn cover, to the ooohs and aaahs as we unpacked doodling projects mailed in from all over the world. We loved it, and so will you. Visit Maelynn's blog, the scrappy one. i am a HUGE fan of maelynn's doodling, i'm not the best doodler so when i need help i always turn to her for inspiration. and im so excited for this book to come out. thanks for showing the cover. i'm even more excited now!